Our Sales, Business Development and Digital thought leaders are eager to share their experience, systems, successes stories and best practices. We love sharing and connecting with our audiences, exchanging ideas and helping our audiences and partner media companies generate revenue. We give you practical information that you can put to use right after the seminar to make your life better and to help you sell more and generate better results for your clients. Not only are our training sessions informative, but they are fun and interactive as well. Diane Hayes Sales Training & Consulting partnered with Matrix Solutions to bring the Diane Hayes Sales Training & Consulting signature event, Success Leaves Clues Showcase to the Matrix Sales Symposium. Case studies included multi-platform success stories from diverse media entities like iHeart Radio, Pac12, Comcast Spotlight, CBS Television and Volta Charging. An information packed seminar about the changing role of media and an overview of digital’s unique capabilities and how digital and traditional media work hand in hand to help advertisers have more successful advertising campaigns. Included lots and lots of ideas and proven case studies to help sellers generate digital $$$$’s right away. A fun and interactive session. “Getting past the big words, technical terms and breaking down to be relatable and understandable to customers. Very engaging. Love the dynamic personality." Like many media organizations, BAARC, the Bay Area Advertising Relief Committee, had been impacted by the changing landscape of the advertising community. This non-profit was struggling to stay relevant in this changing world. Long established in the traditional media world, BAARC needed to find a way to move into and serve their digital constituents, while still serving its core base of traditional media companies. 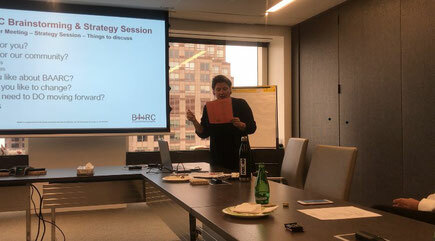 Through a series of strategic brainstorming and strategy sessions, Diane Hayes Sales Training & Consulting worked with BAARC to put together a solid action plan for 2018 with a re-engaged board and created goals and action steps.